True Development Model Captured in Prositions' New Website and Rebrand | Prositions, Inc. True Development Model Captured in Prositions’ New Website and Rebrand | Prositions, Inc. The marketing team at Prositions, Inc. has been actively working through a comprehensive rebranding effort, including a complete website redesign. The new branding and logos of Prositions, the MentorString software platform, and their ProVeteran Program can be seen throughout the website, on various pieces of marketing collateral, new tradeshow booths, and signage. The website contains numerous features, such as mobile responsiveness, search engine optimization, clean layouts featuring updated graphics and images, enhanced readability, and a fresh, new look. A strong emphasis was placed on featuring the company’s True Development Model that is highlighted in a complimentary research paper entitled Beyond Leadership Training. Prositions’ True Development Model is a new approach for creating more effective learning and development programs for organizations. It includes three main components: assessment, development, and reinforcement. 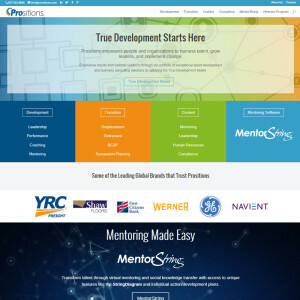 By combining formal, social, and informal learning activities with their new virtual platform, MentorString, Prositions is changing the way organizations help employees develop and grow. Prositions, Inc. is a rapidly growing talent transformation consulting firm that offers virtual mentoring software and services, career transition assistance, and development solutions using the True Development Model. By combining the power of technology with an international network of coaching experts, they are revolutionizing development programs. MentorString, their award-winning cloud-based software, enables organizations to leverage virtual mentoring, engage in secure collaboration, and access high-quality individual development plans with content from industry leading authors and producers. For more information about Prositions and to see their new look, visit https://prositions.com.